I’m sure all the non-Bulldawwg readers may not be waiting with breathless anticipation, but I can’t resist a celebratory post about the Georgia Bulldogs winning the 2012 Capital Alumni Network softball championship. 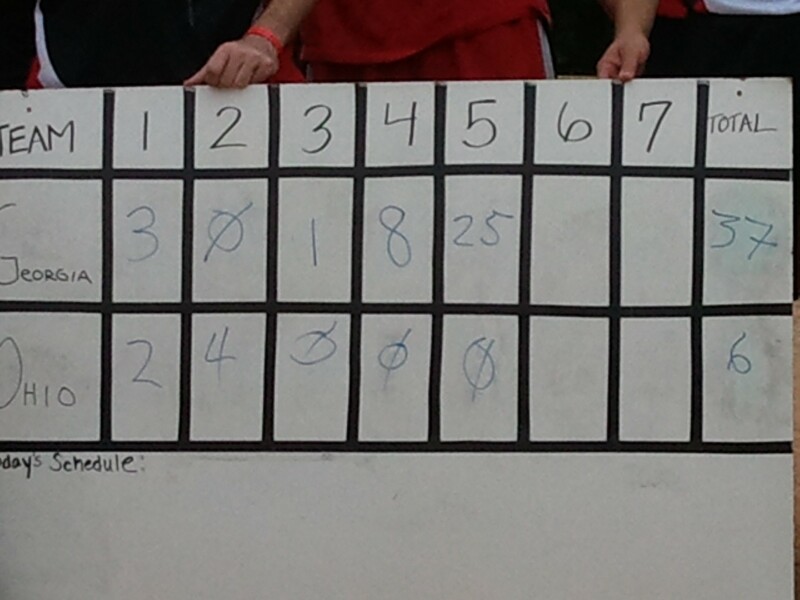 We handled #4-seed American University in the semifinal game, with a workmanlike 14-6 victory. Then, as the scoreboard below illustrates, we let #1-seed Ohio University get a lead before opening a can of you-know-what and grinding them into the dust. The only bad news is that I couldn’t be there for the final, much less have a chance to contribute. I’m sitting at Dulles Airport, waiting for a flight to Chicago. Normally, I would never schedule a flight to interfere with something important like softball, but the tournament was supposed to end yesterday. But the news isn’t all bad, I got upgraded to first class. Not much consolation, but I’ll take it. I’ve certainly complained about Obamacare from a fiscal perspective, warning that it means higher taxes and more spending. And I’ve also warned that it will make our health care system less efficient and could lead to some of the horrifying examples of rationing and poor care that you find in the United Kingdom (scroll to the bottom of this post for some shocking examples). But if you need another reason to be upset, it turns out that Obamacare is going to be a very lucrative gig for a new crop of government bureaucrats. Here are some very disturbing details from the Pueblo Chieftan in Colorado. Eye-popping salaries proposed for employees of the health benefits exchange being formed in Colorado grabbed the attention of Republicans and Democrats alike on Thursday. A subcommittee of the board charged with establishing the exchange is considering a draft budget for its federal grant application that would create 24 positions and pay those employees a total of more than $3 million annually to manage the health care cooperative. The average annual salary of a health benefits exchange employee would exceed $125,000 under the plan. …“We have executive directors (of state departments) that are in charge of thousands of people here that make significantly less than that,” said Sen. Bill Cadman, R-Colorado Springs. …A Democrat on the committee overseeing enactment of health benefits exchange legislation in the state agreed that the figures are worthy of scrutiny. …Under the health care overhaul, states were required to establish exchanges. Colorado authorized its exchange this year in SB200. Keep in mind that the $125,000 figure is an average, which means many of the bureaucrats will be getting much bigger paychecks. And also remember that we’re talking Colorado, not someplace like New York City where the cost of living is a bit higher. Even more important, the article refers to the “average annual salary,” which means it probably doesn’t include the gold-plated benefit packages that are far more generous than generally available in the private sector (state and local bureaucrats, for instance, make out like bandits on pensions). And to show that this story is just the tip of the iceberg, let’s recycle my video about overpaid government bureaucrats. And if all the data in the video doesn’t convince you, check out this chart.